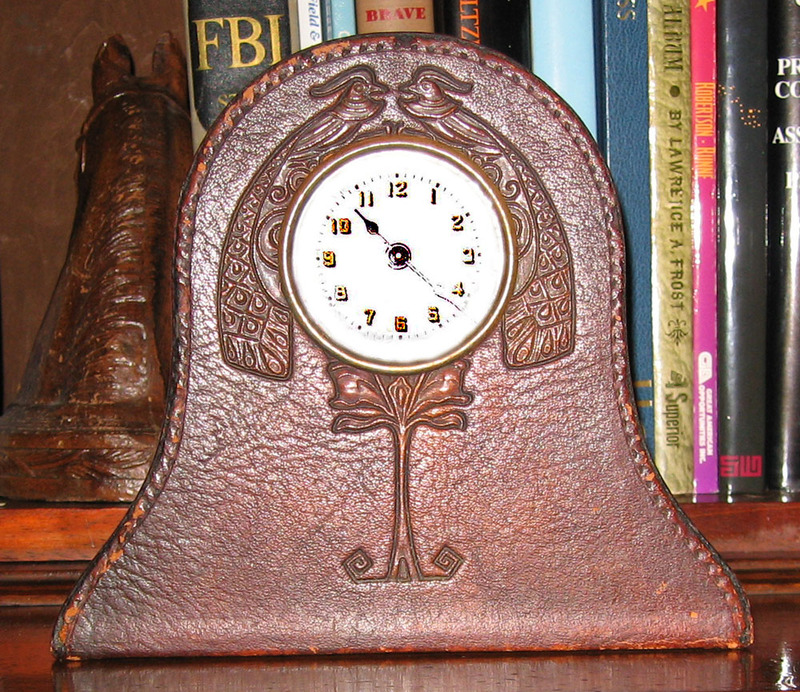 Journals of Henry Bernard Feldhaus, Jr.
Henry Feldhaus was born in Minster, Germany in 1850. 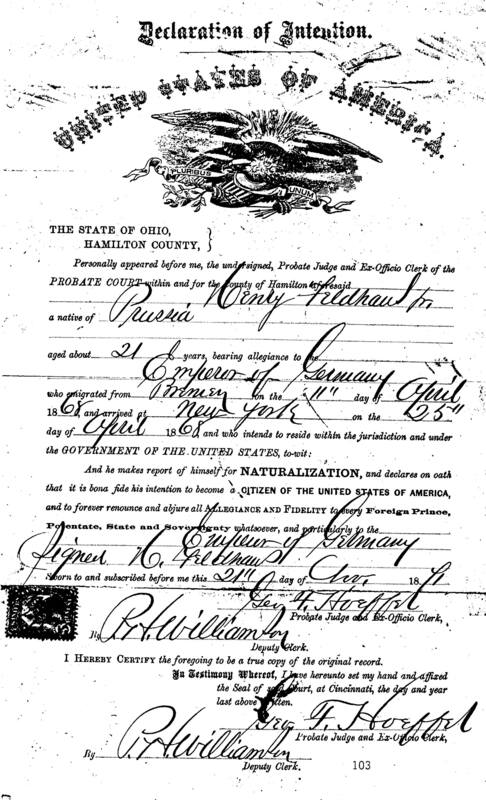 He came to the US from Germany aboard the ship Herman, arriving at Castle Garden, NY on April 25, 1868. Arriving with him were his parents, his younger sisters, Gertrude, age 9, and Anna Therese, age 8, and his younger brother Bernhard, age 4. They left Germany on April 11, requiring 14 days to make the passage. We have heard that his parents came to the US so their son would not have to fight in the wars of German unification that Bismark was undertaking at that time. He was 17 when he arrived in the U.S. 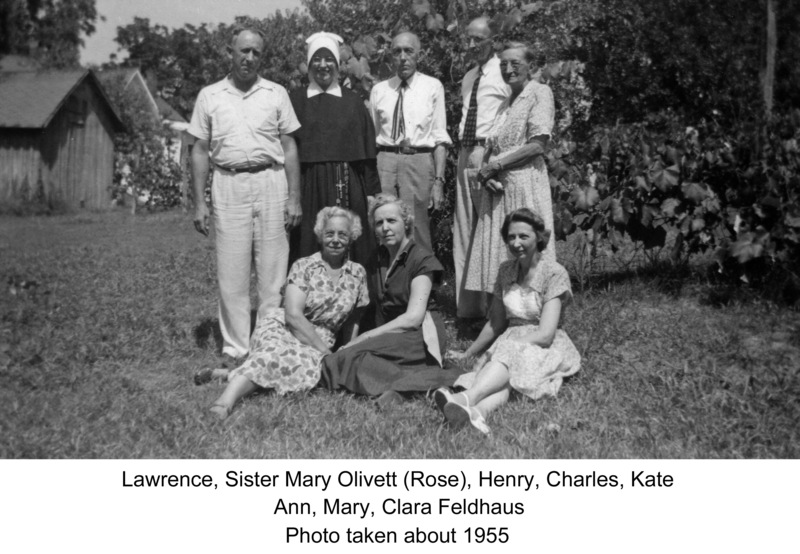 The family came to Cincinnati, Ohio, where there were a number of German Catholics. 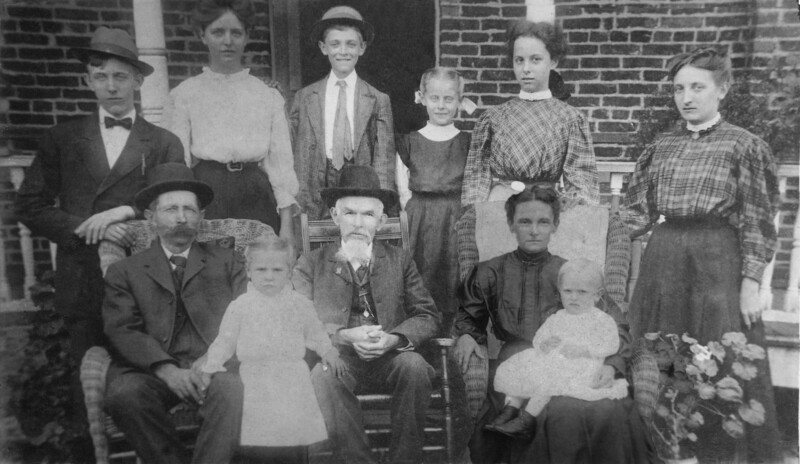 They lived in Boone County, KY, across the river from Cincinnati and then bought land outside Lawrenceburg Tennessee, and moved there with their families in 1871. He was a brick mason by trade, specializing in building furnaces for iron mines in the immediate area and across the south. He also did general brick construction. 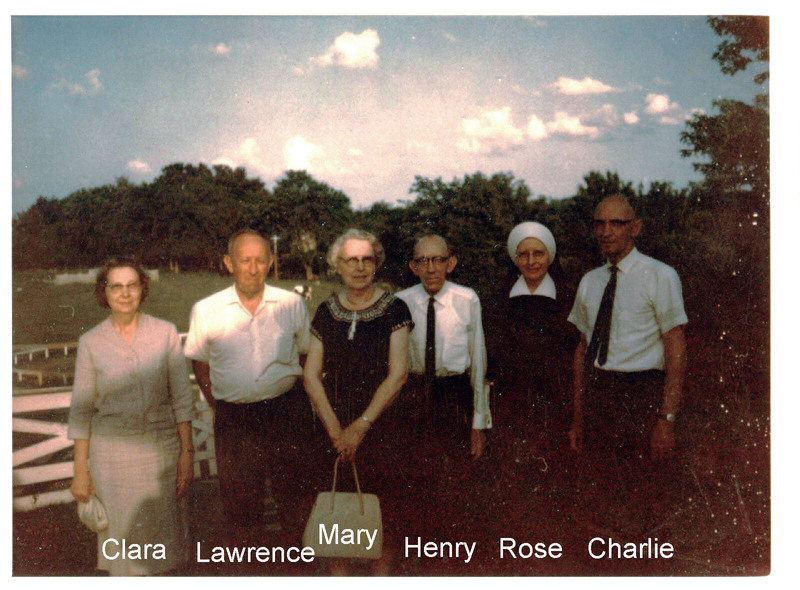 Henry Bernard Feldhaus and wife Mary Ann Schneider with Henry and Cate in the back row and Ann, Mary, and Charles in the front row. George Aloysius Feldhaus was born on August 23, 1884 in Warner, Tennessee, and was baptized on October 5, 1984 in the Sacred Heart Church in Lawrenceburg by Reverand Engelbert Ruff. 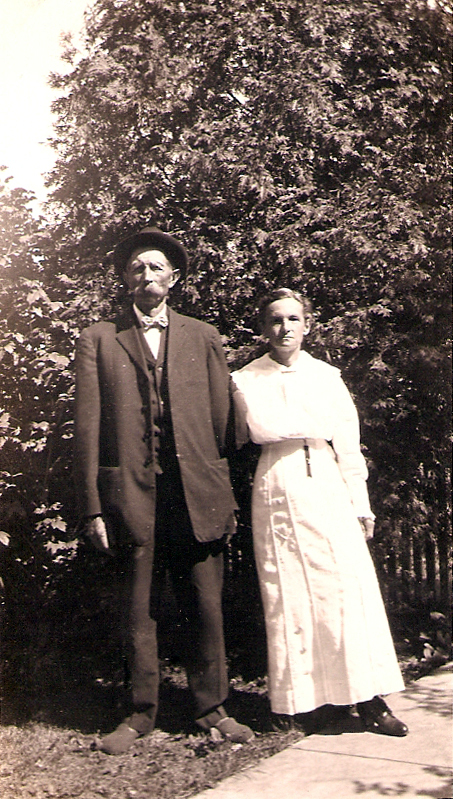 George died on August 9, 1885 in McEwen, Humphries County, Tennesse and was buried on August 10, 1885 in McEwen. His godparents were George and Mary Schneider. Rose Theresa Feldhaus was born on February 16, 1898 in Lawrence County, Tennessee, and was baptized on February 20 1898 in Sacred Heart Catholic Church Lawrenceburg, Tennessee, by Rev. 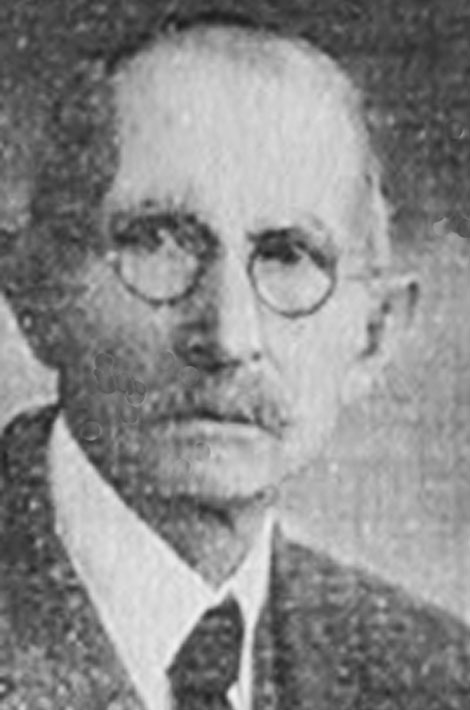 J. W. Sleimers. Rose died on March 11 1898 in Lawrence County, Tennessee, and was buried on March 13, 1898 in Calvary Cemetery, Lawrenceburg, Tennessee. Her godparents were John and Theresa Schneider. 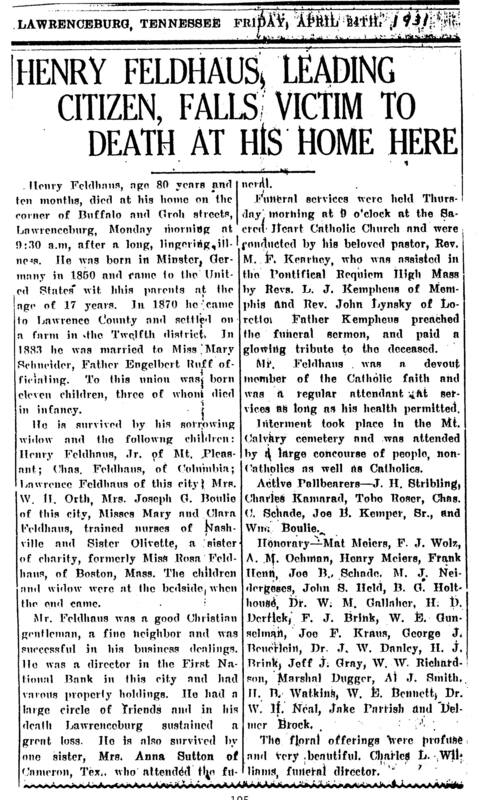 Joseph George Feldhaus was born on September 28, 1909 in Lawrenceburg, Lawrence County, Tennessee, and was baptized on September 29, 1909 at Sacred Heart Catholic Church Lawrenceburg, Tennessee, by Rev. H. A. Ottke. Joseph died on July 1, 1911 in Lawrenceburg, Lawrence County, Tennessee, and was buried on July 3, 1911 in Calvary Cemetery, Lawrenceburg, Tennessee. His godparents were Joseph B. and Magdalene Schade. 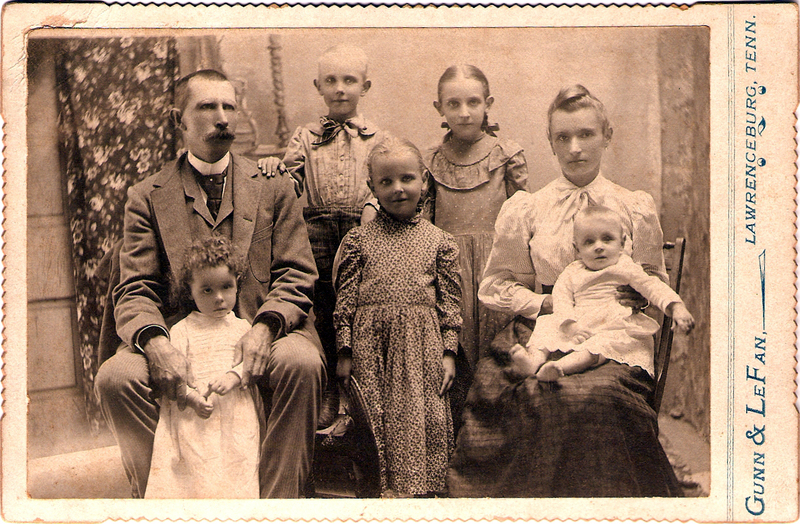 The Henry Feldhaus children. Cate and Ann were deceased when this picture was taken May 30, 1965. 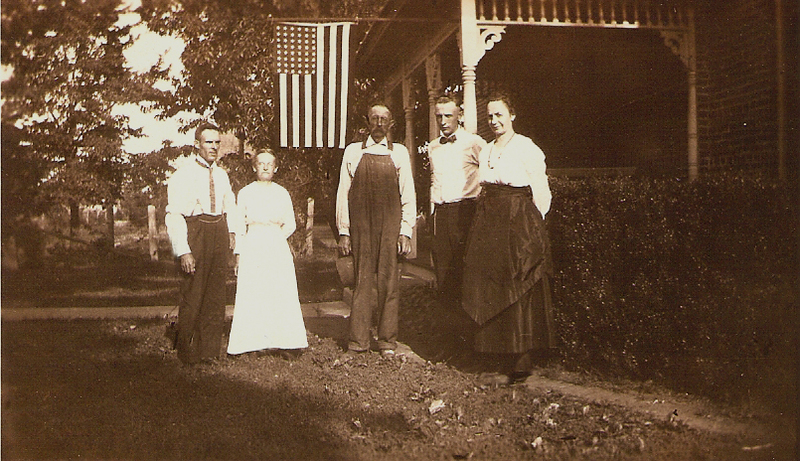 At the age of 52 he built a house on several acres of land at the corner of Groh and Buffalo Road in 1902 and resided there with his family until he passed away on April 20, 1931 at 80 years of age. Feldhaus House on Groh Street at the corner of Buffalo Road in Lawrenceburg, TN The house sat on several acres of land with a large garden and numerous fruit trees. Feldhaus Home as it looks now from the side in 2009. Kamarad home a block away has faired much better in 2009. This is the best view I could get of the Kamarad home. 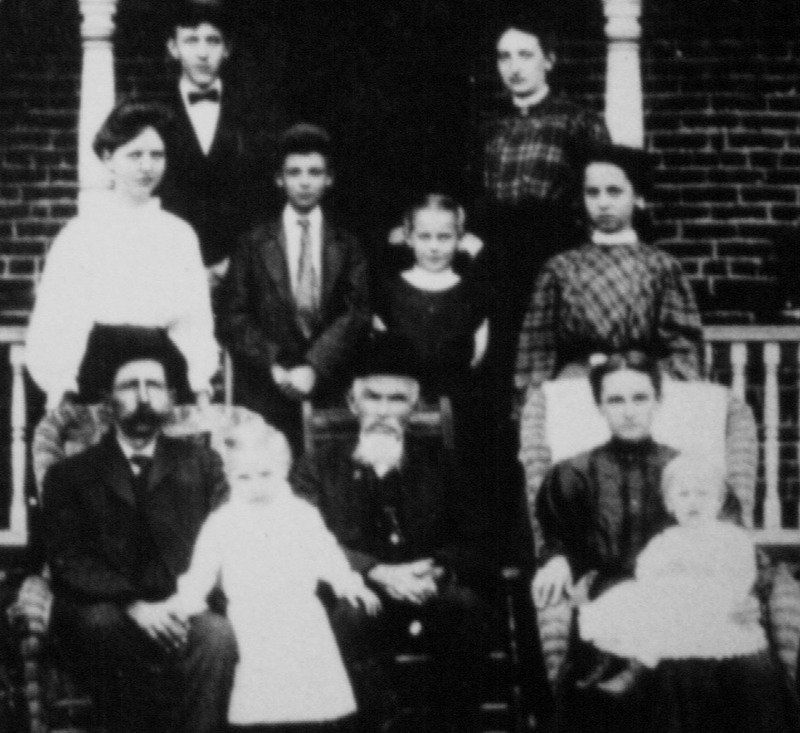 When Henry Feldhaus, Jr. and family moved to Lawrenceburg, they rented the old Martin Lithard house from Mr. and Mrs. Frietch. This house was located on lot 57 in the German Addition. 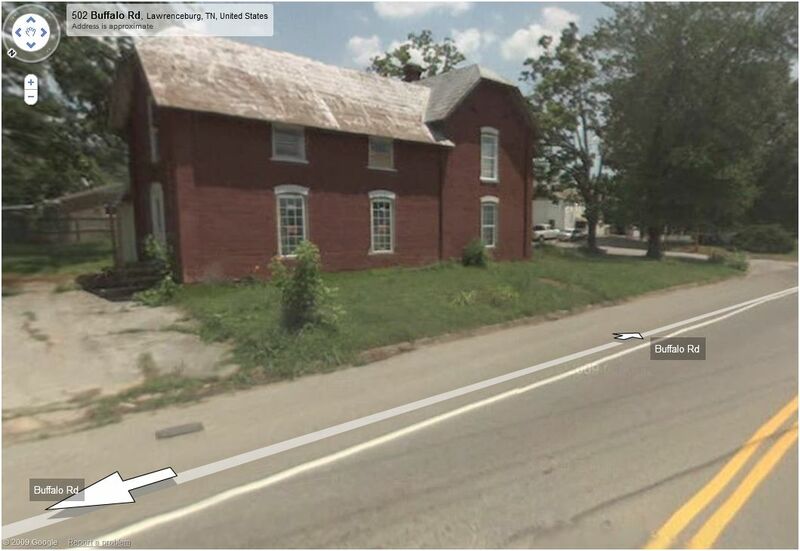 The house faced Berger Street and was one lot east of Fisher Alley. The south side of the lot bounded on Selle Alley which runs between Berger Street and Deller Street. 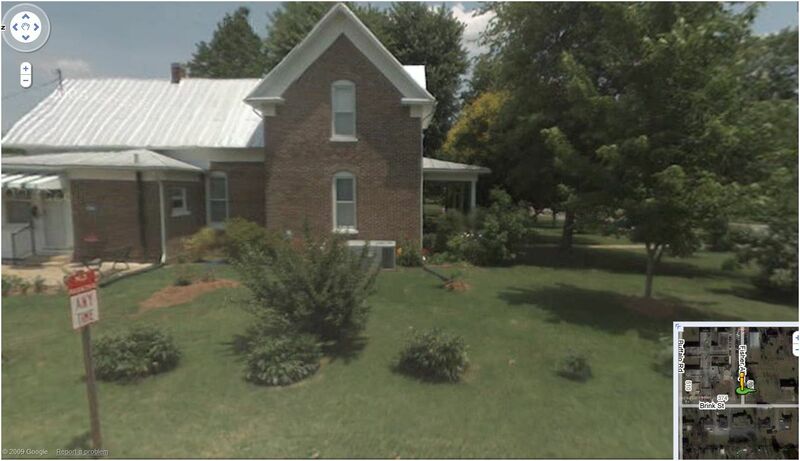 This means it was across from the house that Sis Kemper lives in now (1994). 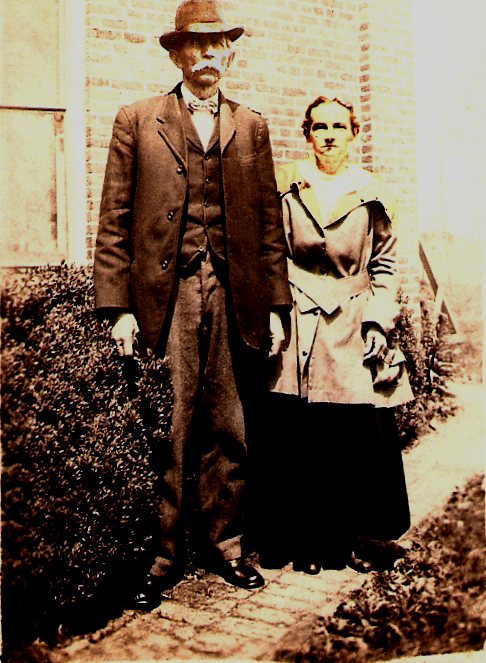 On September 18, 1901 Henry and Mary Ann Feldhaus bought the property on the corner of Groh Street and Buffalo Road from F. J. Wolz for $550. 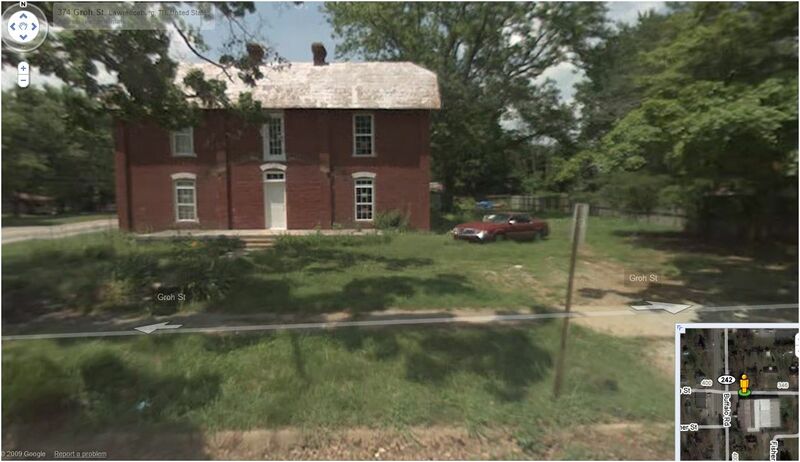 This lot had been the old parsonage property and was bought by Mr. Wolz at auction on May 5, 1901 for $550. Before this the land, along with a majority of the German Addition property, had belonged to the Bentley farm. I have been told (even though Mr. Feldhaus did not mention the fact in his journal) that he first had to move the Bentley house back and later used it as a barn. A large orchard lay to the east of where the house was to be built with two fruit trees of every kind. Mr. Feldhaus had to clear out some of the dead trees and cut down a few trees. 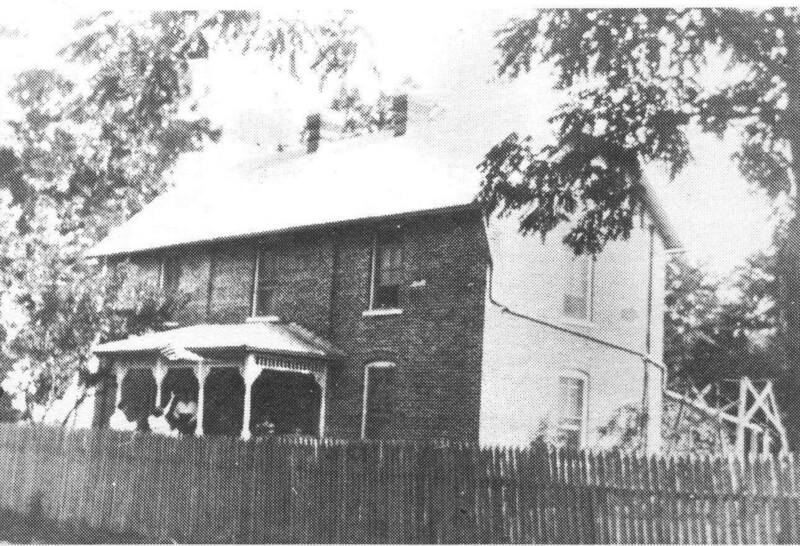 In early 1902 the house was started. Many loads of sand were hauled by Mr. A. E. Black while Mr. Russell hauled gravel. Rock was taken from Mr. Hovelmeier field for concrete. Brick was purchased from Mr. Boulie. Loads of lime were brought in. 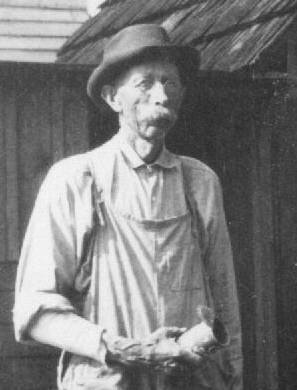 Lumber was purchased from Fleeman Brothers and Mr. Morgan Spence. On April 7, 1902, Mr. Feldhaus staked off the house and located where the cellar and cistern were to be dug by Mr. Gaul/Gault. In June the cistern was finished and gutters put up. Around the first of July work on the cellar was started. By the last of July work began on the foundation. Mr. Feldhaus contracted John Frietch to do the carpenter work and painting. The sash and doors were made of coarse poplar. The shingles were of yellow poplar. The house was to have three coats of paint on the outside, two coats of paint on the inside, and two coats of paint on the roof. The outside walls of the house were double bricked and had solid brick partitions. Gingerbread trim adorned the front porch. Inside the house Mr. Frietch was to make three wardrobe closets, one pantry and china cabinet combined, and one bookcase. Two stairways were built on the inside one just inside the front door to the right and one leading off the kitchen in the back of the house. One stairway was built to the cellar with the house over the entrance to the cellar. A hallway ran all the way through the middle of the house with an outside entrance in the back from the hail and from the kitchen. The bathroom was in the back of the house. A picket fence was built around the yard. Prices for some of the supplies: doors and windows $50; brick $200; cement $20; lime $25; Mr. Frietch for carpenter work $130. 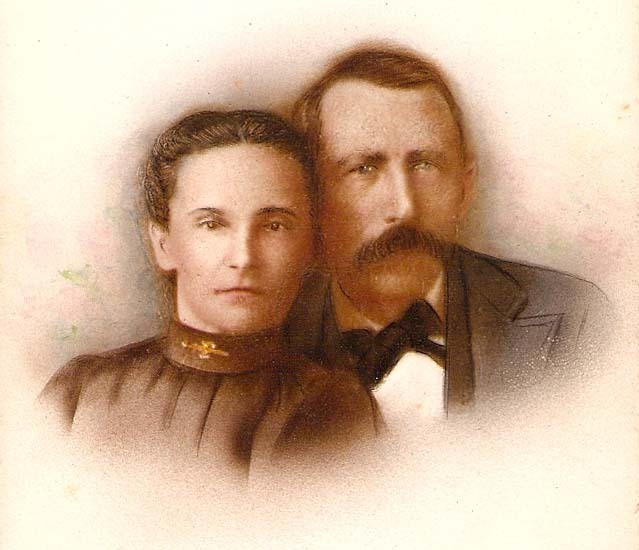 Mr. Charles Kamarad and his wife, Theresa Schneider, who was a sister to Mrs. Feldhaus, Built their home from the same plan as did the Feldhauses. 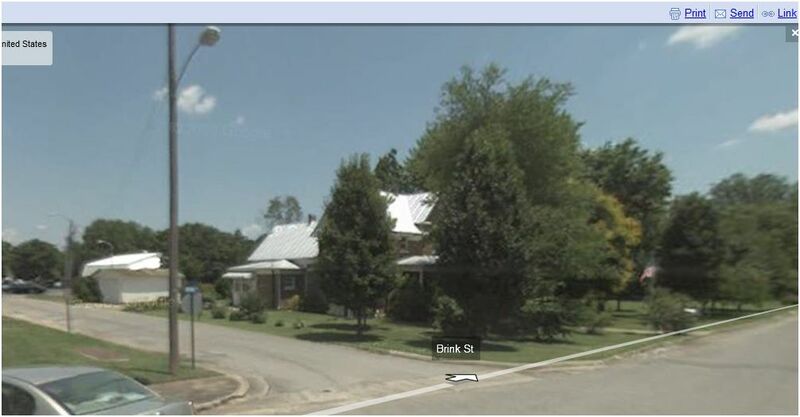 Their home was built on Brink Street. 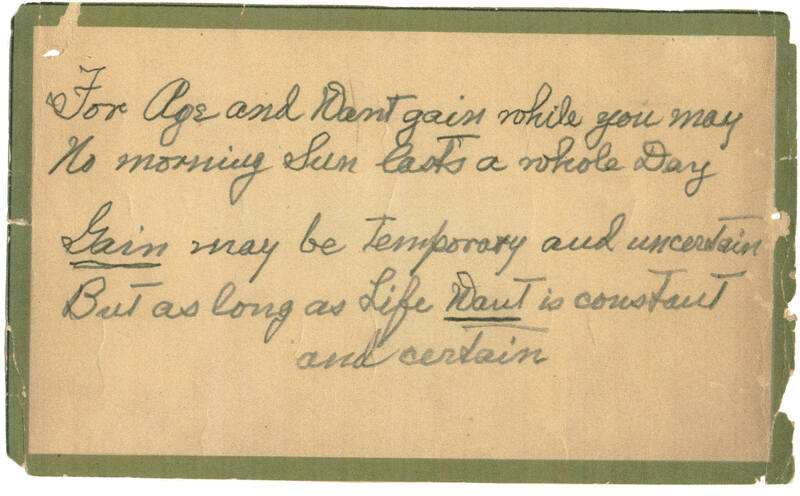 Clara, the daughter of Ann Feldhaus Boulie gave me the following which she obtained from Clara Feldhaus. According to Clara Feldhaus, her father, Henry Jr., always left something posted for the children to read and think about when he was away. 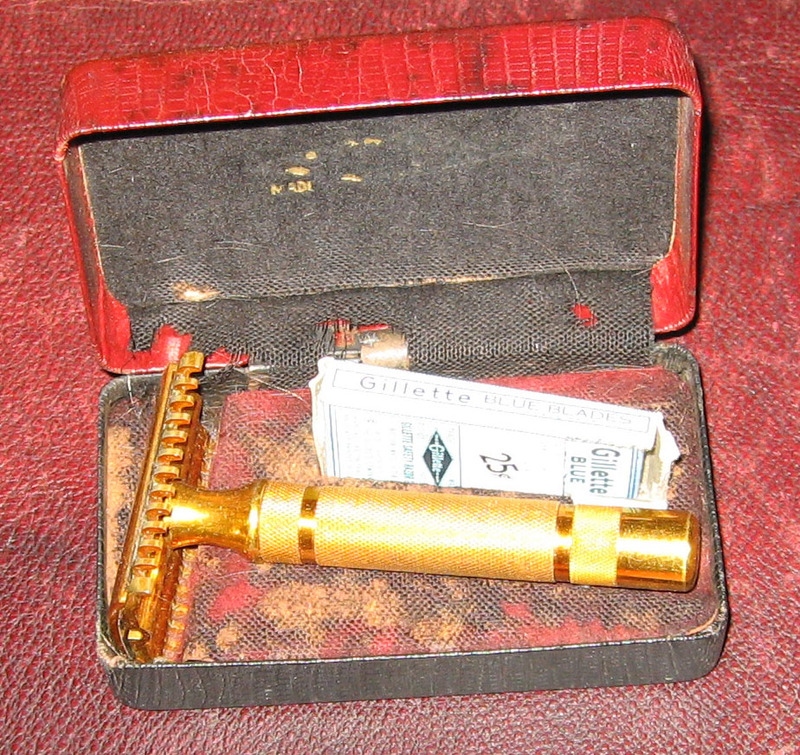 I have five things that belonged to Henry Bernard Feldhaus, Jr. 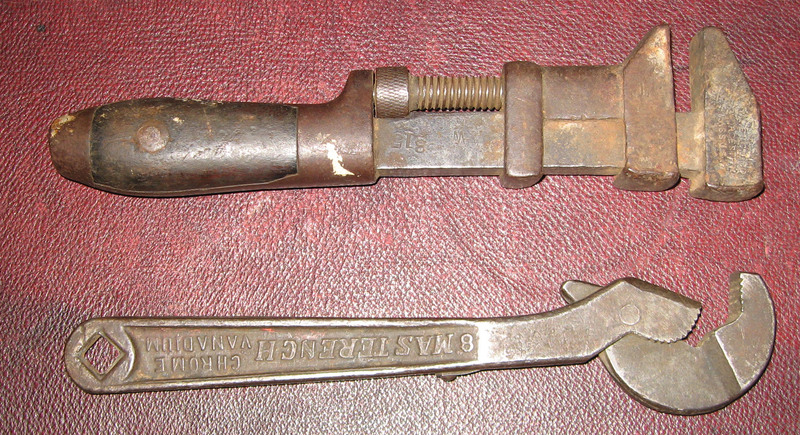 They are shown in the pictures below.